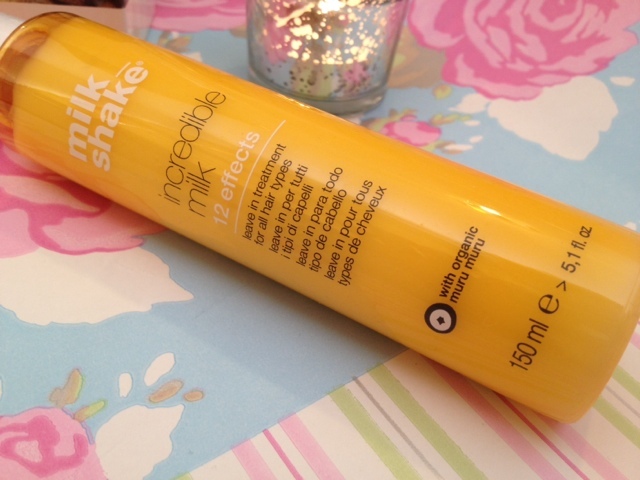 Milkshake 12 Efffect £12.99 for 150ml. Milkshake 12 Effects leave in conditioner is the new release from the Milkshake range. If you've never heard of Milkshake before they're a professional hair brand that use milk proteins in all their products to strengthen and nourish the hair from within. Milkshake 12 Effects is their take on the much loved and difficult to get hold of Miracle 10, a leave in conditioner that preforms 10 tasks in one bottle, this one from Milkshake promises to deliver 12, so how does it preform? I have used both products and like most people fell in love with the concept and results of the original Miracle 10. 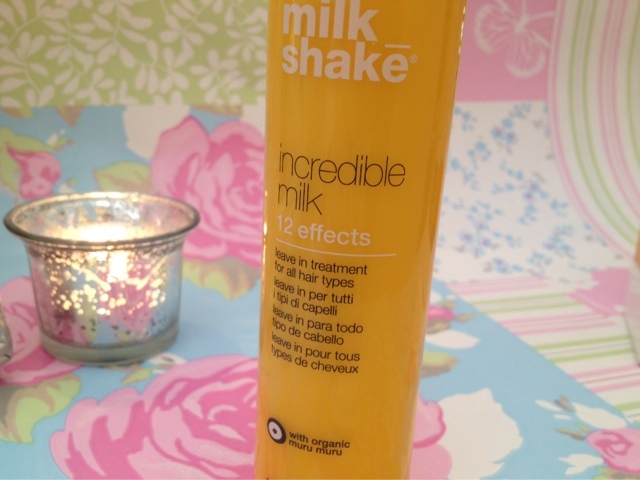 The Milkshake version is nothing is shy away from, promising to deliver 12 effects that will transform your hair! The contents is a thin conditioner like consistency which is sprayed onto towel dried hair. The smell is absolutely delicious, reminding me of Mr Whippy ice creams with a milky vanilla fragrance. Yummy! My hair is very dry due to years of highlighting and colouring and the use of straighteners and hair extensions. The hair extensions I use are micro loop and not the clip in ones which means they are permanent and take a lot to look after. They need a lot of moisture putting back into them as they no longer get the natural oils from the scalp. When I first tried this I thought it wasn't really going to work on my straw like hair, but I'm happy to say I was wrong! It takes a lot for a hair product to WOW me, having tried so many in my job a lot seem to promise the earth and perform very little, but this product is different and stands out from the crowd in my opinion. My hair was left feeling silky soft and moisturised. I could tell by the texture of my hair that it was nourished right to the tips, making them feel smooth and not uneven like they were before. It was left easy to comb and was a lot more manageable, something that my hair rarely is! My hair is also very fine and often gets weighed down by heavy products making it greasy and lifeless, the rich lotion is light, which is surprising due to the cream like consistency and it only took a couple of sprays to leave my hair coated in the hydrating potion. I would recommend this to anyone with dry, porous and over processed hair, or hair that tangles easily and needs a bit of TLC. With winter here and central heating warming up our homes our hair can dry out even more and need a bit more attention. This would be perfect for that and I promise you, you will not be disappointed! I know that's a big statement to make but this has really impressed me and I think I prefer it to the Miracle 10, its richer and more hydrating. Lots of clients have commented on it while I have been using it in their hair at work and I have had no issues or problems with it so far. Have you tried this or any other products from the Milkshake line? Ooh we love leave in conditioners; never tried this one though. By the sounds of it think we would fall in love with it too :-) That's good to know about the results as our hair is also fine. Must try! Thanks for sharing.